York Castle Museum celebrates its 80th anniversary this month, having opened to the public on 23 April 1938. 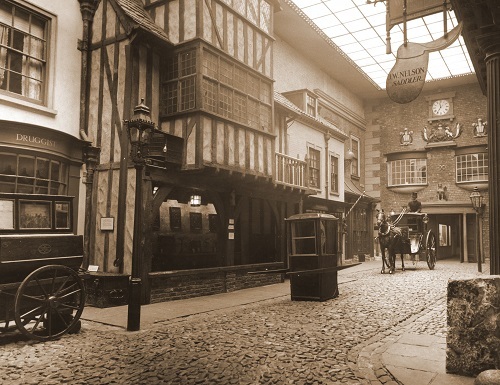 The museum is perhaps most famous for Kirkgate, a recreated Victorian street which transports visitors back in time. Find out more about the man behind the museum and its creation in this blog entry. Dr John Lamplugh Kirk was born in Hull on 30 April 1869. He was educated privately in Ilkley before attending Christ’s College, Cambridge. 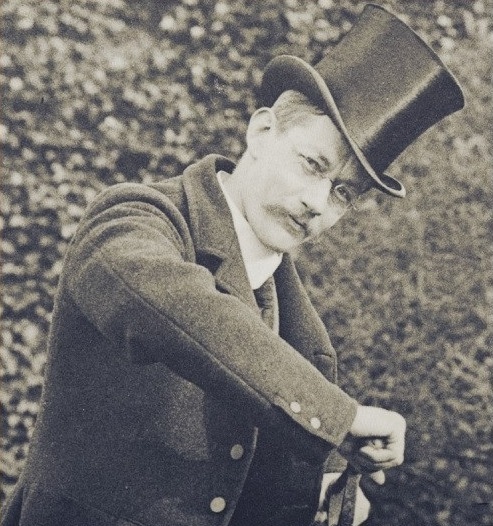 In 1893 he married Norah Rose and had two children before moving to Pickering, North Yorkshire, in 1898. John and Norah had a third child there. Dr Kirk was fascinated by history and by vanishing ways of life, especially in rural communities. Due to industrialisation, life during the period was rapidly changing, and many of the traditional ways of working were becoming obsolete and forgotten. Dr Kirk began collecting ‘bygones’ – objects that represented this vanishing way of life. Above: Dr John Kirk in his younger days. In 1910, the Kirks took a cruise trip in Europe. While visiting Sweden’s capital, Stockholm, they went to an open air folk museum called Skansen, which is still running today. The experience had a profound effect on Dr Kirk and his drive to collect, preserve and present the past. By 1918, his collection included everything from perambulators to antique weapons, potato dribblers to a Tudor barge, Victorian hypodermic needles to horse bridles; now it needed a home! In York, Dr Kirk found a firm friend and ally in fellow collector Alderman John Bowes Morrell. He suggested the Debtors’ Prison, part of York Castle, as a possible home for Dr Kirk’s collection. Unfortunately the Debtors’ Prison was deemed unsuitable, but Morrell continued to champion Kirk’s project and suggested the adjacent Female Prison instead. Above: Kirkgate at York Castle Museum circa 1948. Eventually, Dr Kirk was granted the use of the Female Prison for his new museum, and work began. He oversaw all elements of the museum’s building work – from the colour of the walls, the layout of the displays, to the heating system and the entrance fee. Historic shop fronts and interiors were painstakingly restored and reconstructed to create the street that Morrell suggested should be named after him; Kirkgate. The public, inspired by Dr Kirk’s efforts, started to give donations almost immediately. The museum opened on St George’s Day (23 April) 1938, with queues stretching around the base of Clifford’s Tower mound to explore this innovative new museum. Would you like to know more about our collections and exhibitions? Take a look at our website here, search through our online collections, or explore hundreds of years of social history during a visit. 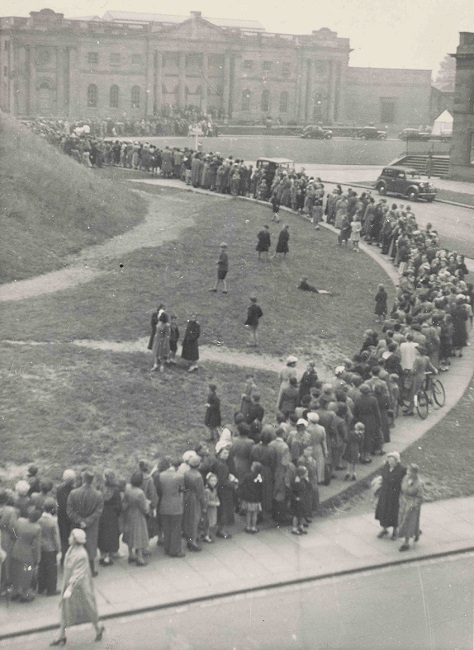 Above: Crowds queue to get into the newly opened York Castle Museum, 1938.